Spirit of Race will start tomorrow’s Agile 4 Hours of Shanghai from pole position, after Pipo Derani set the fastest time of the weekend so far, a 1:55.476, in qualifying at the Shanghai International Circuit this afternoon. Derani’s form continued from his run of form from the two practice sessions earlier today and yesterday, in which he ran fastest in both. Notably, his qualifying time over a second quicker than his previous best time, set in FP1. Harrison Newey came closest in the #24 Algarve Pro Ligier JS P2 Judd, the Briton’s best time a 1:55.804, three tenths off Derani after multiple efforts trying to better his lap. “I feel great, this weekend has been very good so far,” Derani said. “We know the race is a different story, but we have a very quick car. My engineer has been having so much fun with us improving the car. Phil Hanson also came within a second of Derani, nabbing third in the #22 United Autosports Ligier JS P2 at the very end of the session with a 1:56.230. 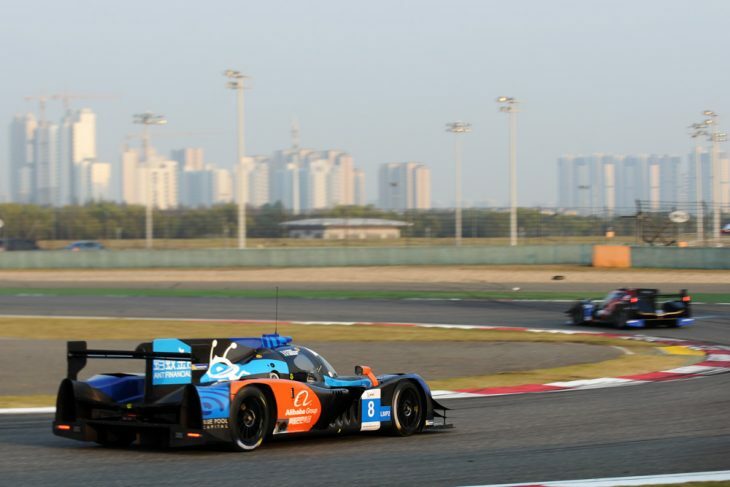 That pushed the only ORECA 05 chassis in the class – the #1 from Jackie Chan DC Racing – to fourth. The #23 United Autosports Ligier ended up fifth. In LMP3, Inter Eurpol took the top spot, the Polish team, which won the ELMS finale in Portimao, is clearly still riding that wave. Jakub Smiechowski set a stunning 1:59.711 to beat Viper Niza Racing’s Nigel Moore to the class pole. Behind the Vipa Niza Ligier were the two United Autosports Ligiers, the #2 leading the #3, slotting in third and fourth, filling the second row. GT pole meanwhile went to the #88 TianShi Racing Team Audi R8, Dries Vanthoor the quickest driver in the field, setting a 2:02.603, the Belgian the only driver to lap in the 2:02s in the session. Second in the class was the #11 Car Guy Ferrari, which had to press on at the end after James Calado had his early laps deleted. The Briton came in for a tyre change and managed to jump from the bottom of the timing screens to a front-row grid spot with a 2:03.286. Calado’s lap pushed his fellow WEC AF Corse teammate Alessandro Pier Guidi down to third in the Spirit of Race Ferrari. The Italian’s time was seven tenths off. Remarkably, the TSRT Mercedes AMG GT3 which arrived at the circuit after a 1000-mile road trip after Free Practice 2 this morning (replacing its irrepairable Audi R8 LMS), managed to get 3.1 seconds off the pole time and qualify third in what was effectively a shakedown for the car. The ACO allowed Max Wiser and Xu Wei to run in the session, so both were able to get laps in ahead of the race. Benny Simonsen topped GT Cup, with a 2:08.401 in the #16 Modena Motorsport Porsche. Tomorrow’s race, the opening round of the 2018/19 Asian Le Mans Series season, will start at 9:30am local time in China.